Depiction of an astronaut by American artist Malcolm H. Smith (1910–1966) for the cover of the June 1953 issue of Universe Science Fiction. In 1938 eighteen-year-old Doris Baumgardt (a.k.a. Leslie Perri) became one of the first two women admitted to the Futurian Society, that influential group of fledgling science fiction writers whose roster would include such names as Isaac Asimov, James Blish, Virginia Kidd, Cyril M. Kornbluth, and Judith Merril. Although she published only three short stories during her two decades in the SF community, her presence in the field is inestimable, as a behind-the-scenes writer and editor for numerous magazines and fanzines. Baumgardt/Perri is mostly remembered today for “Space Episode,” the story that both turns on its head the clichéd tale of a savior rescuing a damsel in distress and mocks the imagined heroics of science fiction readers. (One envisions her attending the first SF conventions, with their early cosplayers, and thinking, “These guys? Really?”) The story generated quite a bit of controversy among SF fans on its publication in 1941, and it has been reprinted in the new LOA anthology, The Future Is Female! 25 Classic Science Fiction Stories by Women. 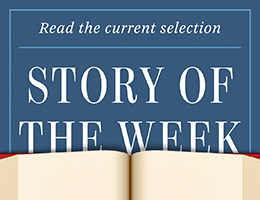 We present it here as our free Story of the Week selection.